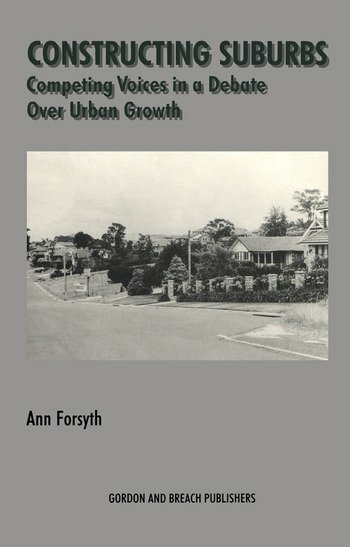 Examining the debate between activists and professional planners over the vision of the future of a large growth corridor in Sydney, Australia, this case study maps the history of development from the late sixties to the mid-nineties, during which time serious environmental and financial problems arose. The book outlines five major visions of the future development and examines forms of political, economic, and institutional power applied by the parties in the project, with emphasis on the processes of infrastructure privatization and ecological impacts. The conclusion reflects on contemporary dilemmas about pluralism. "Constructing Suburbs is an assured integration of primary and secondary data analysis infused with theoretical sensibility....The writing style subtly and skillfully negotiates the author's insider/outsider roles, and the book emerges as a lucid and accessible account, complete with interpolations to make "Australianisms" intelligible to an American readership....This is truly disciplined writing in all its pieces."